Evgeni Plushenko performs his long program at the 2013 Russian National Figure Skating Championships. Evgeni Plushenko won his tenth title at the 2013 Russian National Figure Skating Championships in Sochi. Sergei Voronov came in second, 12 points behind Plushenko, while Konstantin Menshov pulled up from sixth place to win the bronze. 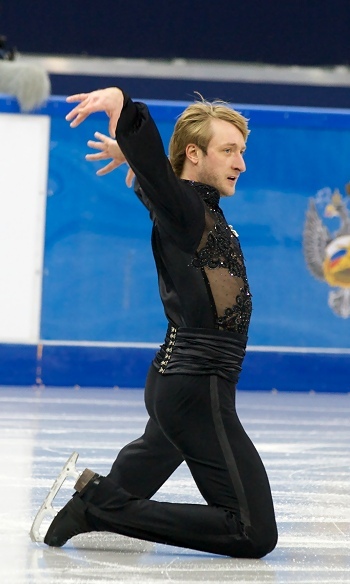 In Sochi, Plushenko’s rendition of Saint-Saens’ Rondo Capriccioso and The Swan was more coherent than the first draft of the routine presented at the National team test skates in September. However, the performance was an uphill battle for the skater, who won his fist national title back in 1999. The protocol of his performance is another testament to his skills as a competitor: even in pain and under duress, he was able to produce a slightly flawed quad toe loop (he two-footed the landing), two triple Axels, and four more triples. Most of his spins were rated level two, however, and therefore he only earned the second highest technical sum of the night. Nevertheless, his program components scores, including three 10.00s, put him into a comfortable first place with 174.26 (79.74/94.52) for the free and 265.94 points in total. The 2012 European Champion said that he had even entertained the thought of withdrawing. Even through an earthquake, his thoughts were on skating. His first experience of an earthquake is also from Sochi while visiting friends. Voronov laid down one of the best performances of the season, but it was not good enough to challenge Plushenko. His only mistakes were turning a planned quad toe loop-triple toe loop combination into a triple-triple and an edge call on his triple flip. His interpretation of Nino Rota’s Romeo and Juliet was not particularly nuanced, though. He picked up 166.37 (82.31/84.06) points and had 254.06 in total. The two-time Russian champion thrives in competition. Voronov did not expect to experience an earthquake during Russian Nationals. The student of Nikolai Morozov claims that good health is the main reason for his success this year. Skating first in the last flight, Menshov was strong, but not flawless. He stumbled out of his opening quad toe loop and his final double Axel. He was otherwise solid in between most of his elements, including a quad toe loop-triple toe loop combination, and finished third in the long program (155.00 (76.64/78.36)) and overall (228.88). For the Voronov, an earthquake was a novel experience. The skater was told later that one should stand in the doorframe as it gives you a better chance of surviving and/or preventing injuries. Artur Gachinski pulled up to fourth place with a performance in which he had no falls for the first time this year, but also no clean quads. He tripled the first one and stepped out of the second. All other elements were well done, however. The 2012 European silver medalist picked up 152.88 (72.94/79.94) for the free and earned 227.46 points in total. Maxim Kovtun slipped to fifth place overall. The 2012 ISU Junior Grand Prix Champion, who only truly mastered a quad this year, devised a very ambitious plan for the National Championships: he wanted to perform three quads in his long program – two toe loops and one Salchow. He popped the Salchow and tripled the first toe loop, but nailed the third jump, a solo quad toe loop. From this point on, he delivered a clean routine, but with only 5.80 points for the two opening jumping passes, his technical mark was too low. He earned 149.64 (68.36/81.28) and had 225.02 in total. Vladislav Sezganov pulled up to sixth place (209.78), while Mikhail Kolyada slipped to seventh (208.96). Young Alexander Samarin finish eighth (205.35) ahead of Artur Dmitriev (204.24) and a fellow debutant Alexander Petrov (203.57). The remaining seven skaters scored below 200 points in total. The Russian Figure Skating Federation selected Plushenko, Voronov, and Kovtunto to represent the men at the upcoming 2013 European Figure Skating Championships.